We are a bunch of dedicated bronies who decided to do as much as we can for our community. We’ve quite a lot of real world experience from our daily jobs and wish to make use of it to create something great, such as MLP: FiM Convention! 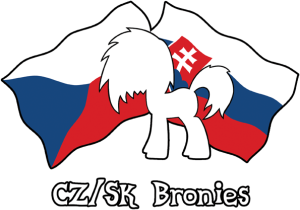 In 2013, we founded the citizen’s association CZ/SK bronies z.s., registered under Czech Republic – Ministry of Internal affairs – which since then covers Czequestria as well as other CZ/SK bronies big meetups. There is a big chance that you may have met some of us around our travels in Europe! Be it at the Galacon, where we’ve brought an entire bus full of bronies from Czech and Slovakia and took the convention by the storm while singing the “Cafeteria song” from the Equestria Girls (or Shake Your Tail during the 2014 performance). Or heard the piano play from Piano Zecora, as the nickname of Pidi goes. And to not just see us in person, but also to see some of us on YouTube… or even TV! For these special circumstances, Jamis aka Flutterguy, is our dedicated person to speak to for he has the most experience by far! So far, he has been on BBC News including the News front page for a whole week and also got interviewed by the National Geographic for the program called “The Outsiders”. Since the year 2012 we visited almost every big brony convention in Europe: Galacon, BronyDays, BUCK, CrystalFair, BronyFair… where we met many wonderful people: guests, organizers and attendees. In the end, we made a panel about all of this in the faraway Tokyo at JapanPonycon. Neither the BronyCon, TrotCon or BABScon in USA we missed. This year our journey led also to St. Petersburg in Russia to Ponirebrik and to DerpFest in Moscow. All these journeys and hundreds of unforgettable memories with a lot of people confirmed the message of the series we admire, summarized in simple message: Friendship is Magic, wherever you are. I heartily hope that the impression left by Czech and Slovakian bronies is good and inspiring! We do try to cosplay at every opportunity as it is a great way how to experience the convention vibe and to make new friends! Also… do you know why the moment from BronyDays 2013, captured in the last photo on this page, one of the most important for Czequestria? Few seconds after this picture was made, M. A. Larson (one of the “My Little Pony: Friendship is Magic” scriptwriters – on the photo second from the left) convinced us, that we should definitely make a brony convention in Prague. And as we promised him in that moment, so it happened less than one year after. 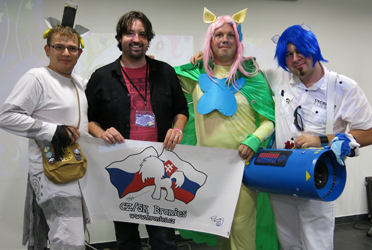 since then, Czequestria took her place side by side other brony conventions held in English and visited by bronies from all over the Europe! So… many thanks to M. A. Larson for kicking our flanks in the beginning, to all attendees for the trust in us and most importantly to everyone contributing to the effort making Czequestria a real thing! If you have a question regarding Czequestria or this website, please let us know via e-mail. @MissLibussa – Twitter account of Miss Libussa – mascot of Prague and Czequestria itself! This Convention would not be possible without encouragement and help from fellow friends at EPCU (European Pony Convention Union) Skype channel from various conventions around the Europe! (cheers!) Check out their conventions right here.